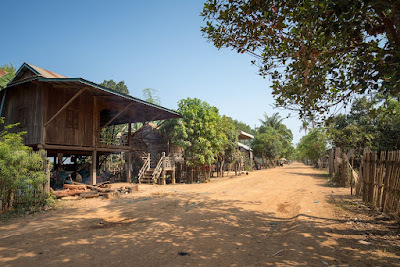 A village in Kratie Province, Cambodia. Kratie province, Cambodia, July 2018: Roeun Loth is 8 years old. She has seven brothers and sisters and lives in Srah village, Thmei commune, about 30 kilometers from the town center of Kratie Province. The family makes a living working in rice farming and the timber business. Loth studies in Grade 2 of primary school. Loth was born with disability in her leg and arm. Her family belongs to the Banong ethnic minority community located at the edge of the commune, making accessibility to school a challenge. Loth used to feel shy and embarrassed about her condition. She worried she would experience discrimination from community members and local government officials, who lacked understanding about the rights and needs of people with disability. Local authorities, school teachers and health staff often did not have enough information about children in Loth’s situation and the services they need. Then a village group leader approached and encouraged Loth’s parents to send her to preschool. The village group had been receiving information and knowledge on disability through Thmei commune’s awareness raising activities. Kouy Sam Oeun is the Srah village chief. He has been conducting communication sessions every three months for about 30 participants in collaboration with Nhek Bolly, the Thmei Commune Focal Point for Women and Children Committees. The sessions cover issues such as early childhood education, birth registration and disability. Srah village primary school has also been providing multilingual education, allowing ethnic minority students to learn both their mother language and Khmer language. UNICEF has been supporting multilingual education and sub-national administration trainings for target districts in Cambodia’s north-east, where many ethnic minority communities exist. It has assisted trainings to develop the capacity of local-level administrations to provide inclusive, responsive social service delivery. By the end of 2017, 352 local administration officers had been trained on social service mapping and 83 trained on “Promoting Social Service with Equity” in Chetr Borei district within which Thmei commune is located. ‘Disability Inclusion’ is one of the training modules that deals with issues such as definitions of disability, rights of persons with disabilities, discrimination, acceptance and support, health protection and safety, ethics, and available services. Commune officers have been trained to plan, budget and implement social service activities related to preschool management, maternal and child health and birth registration. Disability support is a critical part of the social service activities. By the end of last year, 412 officers (92 women) have been trained on disability in Chetr Borei District, where Thmei is one of the 10 communes. Thmei commune received two-day Disability Inclusion training in 2017. As a result, the commune has been conducting communication sessions on disability and has planned disability-related support in its 2018 Commune Investment Plan for discussion at upcoming district workshop. The commune plans include vocational training for women with disability and material support such wheelchairs and prosthetic legs. NGO Veterans International Cambodia offered support by providing prosthetic legs, wheelchairs, vocational training and income generation activities. The NGO is currently implementing these activities based on the Capacity Development for Disability Inclusive Local Governance in Cambodia manual, which was developed in 2016 with UNICEF support. Commune Focal Point for Women and Children Nhek Bolly is enthusiastic about the results of the training and follow-up activities. “Now people’s mindset has changed and there is less discrimination against people with disabilities”, she says proudly. “There is more respect and understanding for people with disability in Thmei commune.” This can be seen by the enrolment of two children with disability in school: Loth, and a blind student from B'ier village. Loth has been enrolled in preschool and primary school. According to Bolly, the girl has now overcome her disappointment about her body and gained confidence about herself and trust for her teacher, enjoying learning mathematics with many friends. She has three best friends. Loth’s parents are also well aware of the importance of education for their daughter’s future. “I want Loth to complete education until Grade 12 and go up to higher education”, says her father, Chheus Roeun, 53. The primary school teacher has been encouraging Loth to actively engage in class activities such as presentations using a white board and reading poems. “Fight for education!” is what Bolly told Loth and her parents when she first visited the family in November 2017. Since then, these words have been motivating Loth.